For all the data we are collecting about the book industry, there is one crucial piece of the puzzle we don’t yet have: robust sales figures for e-books. While individual retailers and publishers, and groups such as Association of American Publishers, Book Industry Study Group and Nielsen BookScan are reporting some sales stats, no-one can yet provide comprehensive figures for how many e-books are being sold, to whom and for how much. It won’t be an easy task: for one thing, e-book sales stats will need to be international in scope: I’m Australian but at the moment the best places for me to buy ebooks from are Kobo (via its partnerships with Australia’s largest bookselling chain Angus & Robertson and with Borders Asia-Pacific) or Kindle. And Australia is only one of very many e-book markets: in his presentation at Frankfurt Tools of Change on Tuesday, Kobo’s Michael Tamblyn said that Kobo sells to as many as 174 different countries in a day. Any attempt to track e-book sales will need to get global feeds from sources including Kobo, Apple’s iBookstore, and presumably Google (once Editions comes to fruition), and to be really useful those global sources will need to break down their sales country by country and then be combined with local ebook sales data in each market. Given Kindle’s current dominance of the e-book market (estimated at perhaps 70% in he US), input from Amazon is crucial; but as we know, that is unlikely to happen. Maybe the solution doesn’t lie with trying to collect figures from retailers (or resellers or “agents” or whatever they may be calling themselves in future) but from publishers. 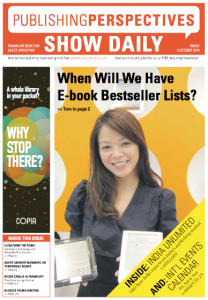 Is there sufficient will among the global publisher community to pool all their e-book sales figures for everyone’s sake?